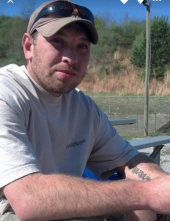 Stanley Christopher “Beagle” Stephens, age 36 of Allen, Kentucky, passed away on Friday, February 8, 2019 at UK Medical Center, Lexington, Kentucky. He was born November 30, 1982 in Prestonsburg, Kentucky to Stanley Stephens of Prestonsburg, Kentucky and the late Marie Spears Goble. He was the husband of Stephanie Rorrer Stephens. He worked for R&H Contracting and attended Bonanza Freewill Baptist Church. Along with his father and wife he is survived by his Sons: Rylan Stephens & Brayden Hall both of Allen, Kentucky; Brothers: Jeffery Goble of Dwale, Kentucky, Brandon Goble of Dwale, Kentucky & Raymond Goble of Allen, Kentucky; Sisters: Ellen Stephens of Prestonsburg, Kentucky, Samantha May of Prestonsburg, Kentucky & Robin Carver of Dwale, Kentucky. He will be missed by all that knew and loved him. "Email Address" would like to share the life celebration of Stanley Christopher "Beagle" Stephens. Click on the "link" to go to share a favorite memory or leave a condolence message for the family.